Winter has arrived and just dropped the most snow we have seen in years on our house. I am not a fan of snow because I hate being cold, but my kids love it and whenever I release them into the great outdoors they head straight into a snow-dive. 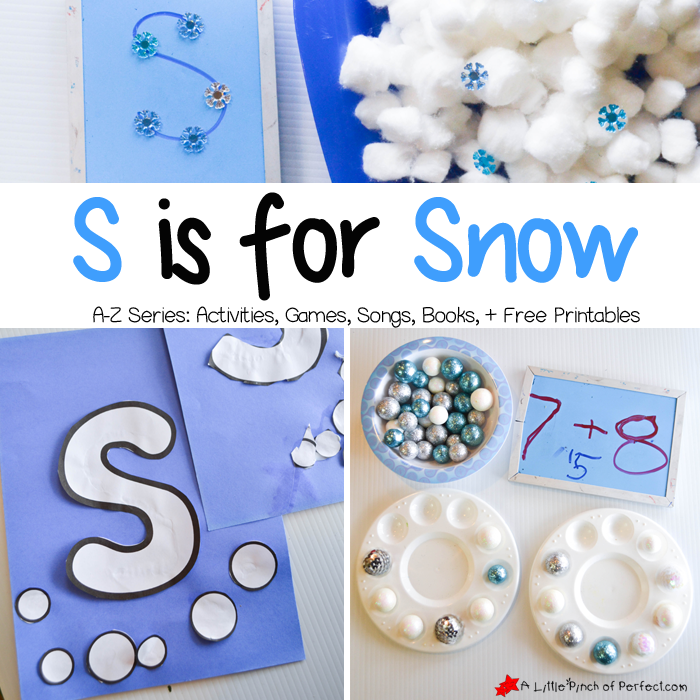 In honor of their love of snow we made a letter S is for Snow craft, put together an easy snowflake sensory bin, and played some snowball math. 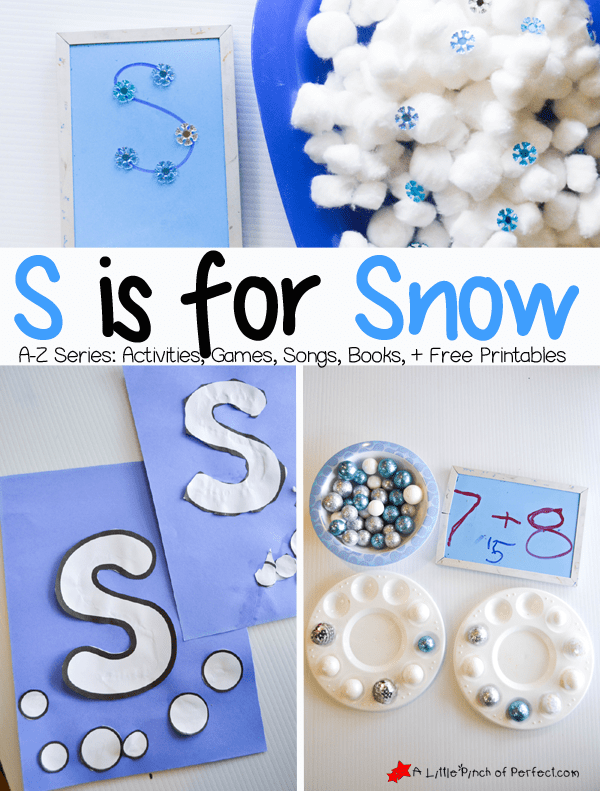 Come check out all our Winter Activities and grab our free printable letter S template. Suggested Book: The Snowman by Raymond Briggs a wonderful winter picture book that children can narrate with their imagination and creativity. 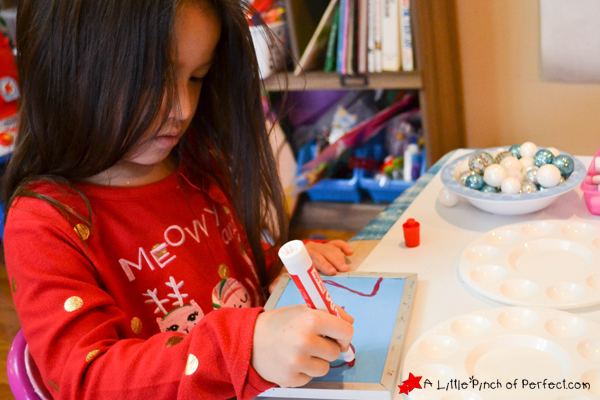 Have child find snowflakes in the “snow” and place them on their counting mat or on the letter S.
Little Tiger (age 5) found it easiest to make a pile of snowflakes and then place them on the mat while counting. Little Dragon (age 2) found it easiest to place each snowflake on the mat as he found them. He would name the number he was putting it on, but did not put them on in sequential order (which is totally okay). They both loved how fluffy the cotton balls felt. Eventually we ended up having a cotton ball snowball fight which was awesome and not cold! When we were done we picked up all the cotton balls and put them back in the bag to use again later. 1. 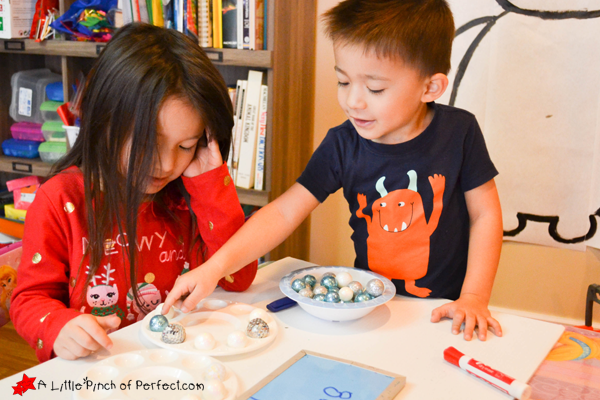 Write down a number (0-10) and have child fill the first tray with the matching number of snowballs. 2. Write down a second number (0-10) and have child fill the second tray with the matching number of snowballs. 3. Count all of the snowballs from both trays to add them up and say the math equation out loud together (“one plus two=three”). 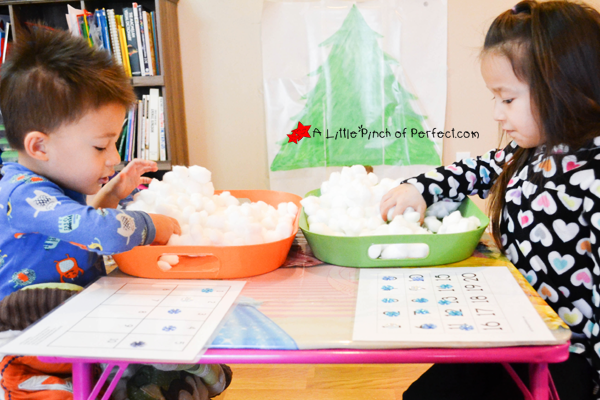 Once the child understands this activity try writing the math equation down and having them fill the trays and add the snowballs together to solve the equation. Little Tiger loved this math activity and asked if she could write her own own math equations. By the end I was just sitting back watching her do the activity herself. 2. Have child cut out the letter S and the snowballs. 3. 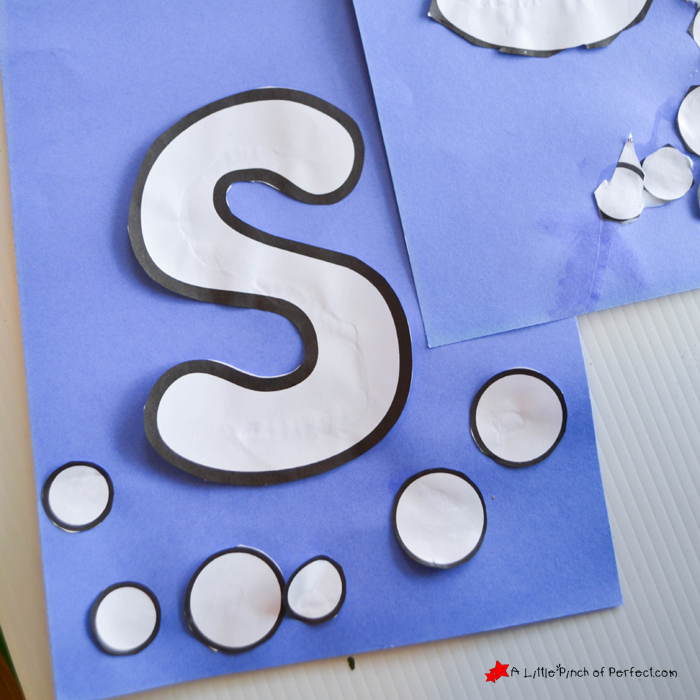 Have child glue the letter S and snowballs to the blue paper. Thanks for learning with us today! Such a fun unit for winter!